Centering which requires you to start your movement on the focal or central point of the method. In Pilates, the focal point refers to the muscles found in the central part of your body including your upper and lower back, buttocks, inner thighs, hips and abdomen so you have to start your exercise from there. Out of the twelve individual online certification courses that are included in the platinum personal trainer certification package offered by Brainmeasures, the Pilates certification course is one of the most vital. You can take the Pilates certification course alone or take it up along with all the other vital courses in the package. 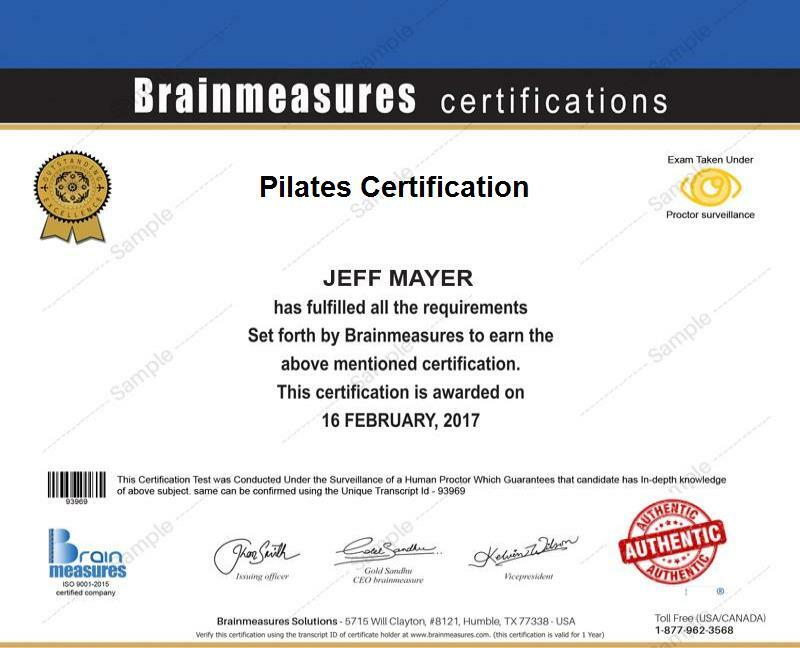 Taking up the Pilates certification course from Brainmeasures is a wise move since the company is guaranteed to provide you the best training possible while making sure that you get adequate knowledge about Pilates and improve your skills in the area. With the help of the Pilates certification course from Brainmeasures, you get the chance to understand all the benefits offered by the fitness system including its ability to improve the strength of your muscles, strengthen your entire body, prevent you from dealing with injuries, restore postural alignment, relieve stress and tension, improve joint movements and enhance your agility, stamina, mobility and blood circulation. Brainmeasures Pilates certification course can also provide information about the different equipment that you can use in successfully carrying out the training. But before getting your certificate in this area, you need to pass the Pilates exam online which is a huge part of the program. The Pilates certification program offered by Brainmeasures can benefit individuals who want to understand how Pilates exercises are correctly carried out so they can start including these in their workout routines. It is also ideal for aspiring and existing fitness trainers and personal trainers who want to focus more on Pilates and who wish to fully understand all the roles, duties and responsibilities of a professional Pilates trainer, the theory, concepts and principles behind the fitness system and the specific movements and exercises linked to it. Completing a Pilates certification course is also a good way to boost your income in the fitness industry. Your certification in this field allows you to earn around $40,000 to $72,000 annually if you work fulltime. Hourly contracts allow Pilates certification holders to earn around $19 to $34 per hour. If you work part-time, then you can expect your annual earnings to be over $21,000 if you work for fifteen hours a week. You can earn even more if you get advanced training in the field and open up your own Pilates fitness club. Those planning to open up their own fitness club, must also consider Master trainer certification course by Brainmeasures which is a wholesome training course giving an overview of all apsects related to body training.